DOCTOR WHO - Peter Capaldi and the return of the darker Doctor | Warped Factor - Words in the Key of Geek. Will Steven Moffat be 'borrowing' elements of the Cartmel Masterplan for the Twelfth Doctor? Christopher Morley examines the evidence. To dig a little deeper into exactly what the 'Cartmel Masterplan' was, we need to take Warped Factor's trusty old Type 40 back to the beginning of the end for Classic Who- that is to say seasons 24- 26. Andy had been taken on as script editor for the series in 1987, & quickly got to work on what was ( & in retrospect still is) a relatively simple mission. He & several writers ( including Marc Platt) wanted to give the Doctor a little of his mystery back, add a little fraying round the edges if you will! 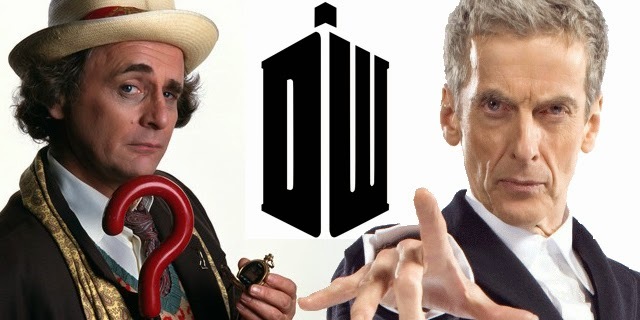 With the casting of a new Doctor- Sylvester McCoy signing up to play the Seventh incarnation following a parting of the ways between Colin Baker & the BBC- the stage was set for the grand reinvention of the programme. Following Seven's introduction in Time & The Rani, several fans might have been forgiven for wondering just where this clown had been picked up from, witticisms like ' absence makes the nose grow longer' & his habit of rrolling his ' rr's no doubt leaving some wondering just what was going on. But having worked so hard to turn him into that figure of fun, Cartmel & his team gradually began to introduce elements of the Masterplan into their thinking. Ben Aaronovitch's Remembrance Of The Daleks, the first flourish of Season 25, is perhaps the turning point, getting the penultimate round of outings for Seven going in quite some style. Not only was his scheming responsible for the explosive end of the Daleks but its implied that his use of the Hand of Omega, played out against the backdrops ( at least in part) of I.M Foreman's scrapyard & Coal Hill School, nicely rounds off a little unfinished business from his First incarnation. It might at this point be worth noting where both Clara Oswald & recently announced new companion Danny Pink are teachers..could it be that Moffat intends to go back to the start in a sense/similar manner? There's also the game-changing contention that the Doctor was someone else entirely before he took on that mantle, a 'promise' as described by the Eleventh. For Cartmel intended to work in the fact that before the Doctor was born by a process known as 'looming' ( see the Lungbarrow novel for more), he was the most mysterious of the three founders of Time Lord society as we know it alongside Rassilon & Omega. Known only as 'The Other', mere hints of this implied past life survived. Aaronovitch's novelisation of Remembrance features a flashback to the early days of post-Cult of Pythia Gallifrey- perhaps providing an explanation of Seven's slip while explaining to Ace what the Hand is ( changing 'we' to ' they' when remembering just how much trouble the prototype of the device caused). He clearly had some history with Morgaine, the villainous sorceress of the piece..but perhaps his greatest manipulation was that of his companion, over the course of Ghost Light ( which was broadcast in a radically different format from what was originally intended, with John Nathan—Turner vetoing the idea that it be set on Gallifrey & dig deeper into the Doctor's origins.) The basic ideas behind the original draft did make it into the aforementioned Lungbarrow, though! While he had indeed been playing Ace like a fiddle as revealed in The Curse Of Fenric, he too was being played by Fenric itself- the ancient evil released after the translation of some Viking runes found during the Second World War. She'd arrived via a time-storm created in a chemistry experiment ( manipulated by Fenric) in a similarly complicated manner to that in which both River & Clara get themselves tied into his later adventures ( as the Silence's assassin-turned companion & the ' impossible girl' who has versions of herself spread throughout all the Doctor's lives in a bid to save him from the Great Intelligence's attempts to undo his very existence). The implication being that he wouldn't necessarily hesitate to use certain elements of it as a basis for his own, & the question of just which he would recycle & what he would add to just such a template for any similar plan of his own for the Twelfth Doctor is certainly worth pondering given that there is infinite potential for things to take a turn towards darkness once more given some of his experiences post-Seventh incarnation!